Set sail from Miami into the beautiful Caribbean. Enjoy the space and comfort onboard the Norwegian Sun. Let the Norwegian Sun take you to some of the best locations in the world while you relax and enjoy an amazing cruising experience. Newly refurbished, this Sky Class ship has got it all – fine dining, world class entertainment and the incredible Mandara Spa. 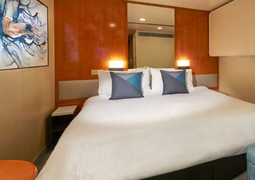 Choose from an array of spacious staterooms to suit your cruise style and let the friendly staff assist you in making sure every part of your experience runs smoothly. In the evening, see a spectacular production of Rock You Tonight, or have a drink in the Windjammer bar, where you can relax listening to piano music, sipping one of their famous martinis. Stroll through the Art Gallery or take a dip in the Oasis Pool, and bask in the calm ambiance of the Norwegian Sun. You are guaranteed to find everything you need for a successful cruise in the many styles of cabins on board the Norwegian Sun. 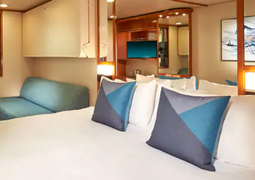 No matter whether you’re looking for a view of the sea through panorama windows, spacious balconies, family cabins with connecting doors or comfortable king-size beds—all are offered on this luxury liner. These cheerful, modern cabins are designed to create an optimal “feel good” atmosphere to help you relax to the max throughout your stay. The Norwegian Sun offers overwhelming possibilities when it comes to dining options. The master chefs on board will pamper you with a wide selection of French, Asian, Italian and Mexican specialties. Two main restaurants provide panoramic views of the sea and surrounding landscapes, as well as a unique, welcoming ambiance. Numerous other bars and cafés are eager to keep you satisfied all day long. The extensive entertainment programme on board offers something for everyone. The Stardust Theater offers showtime entertainment with a Broadway flair, and the Sun Club Casino invites all guests to try their luck at a game of dice, Black Jack, Roulette or at one of the many slot machines. The bars and nightclubs on board the Norwegian Sun shine on long after the sun goes down and invite you to dance the night away with great music and a wide selection of delicious beverages. Time flies on board the Norwegian Sun thanks to an endless selection of free time activities. The ever-present water landscape offers fun for all with two swimming pools, multiple Jacuzzis and a children’s splash pool. Divine beauty and wellness treatments can be found in the Body Waves Spa, whereas the more actively-inclined are welcome to take advantage of the fitness centre, track, putting green and volleyball and basketball courts. The younger guests on board are invited to play under caring supervision in the Children’s Corner, and the teens have the Teen Club at their disposal for hanging out and having fun. Other great locations on board include an art gallery, chapel, shopping areas, modern conference rooms and many more. Although the on board language is English, as a result of international travel guests, German passengers may benefit from German speaking services. The German-speaking guest services include, German menus, shore excursions partly in the German-language and regular consultations with a German hostess. With two main signature restaurants, a help-yourself buffet and a variety of casual cafés you will be spoilt for choice on the Norwegian Sun. The master chefs on board will make sure you receive the finest cuisine, with culinary delights from countries such as France, Italy and Mexico. The Seven Seas Main Dining Room offers an extensive daily changing menu that boast delicious flavours from around the globe. As you sit down to enjoy your meal, you will be stunned by the panoramic view from the inside. Guests also have the option to enjoy a continental breakfast in bed, compliments of the ships room service. This is especially brilliant after the day’s activities. After an exciting day of entertainment and exploring the ship, be delighted in the knowledge that you can retreat to your comfortable and sophisticated living quarters. 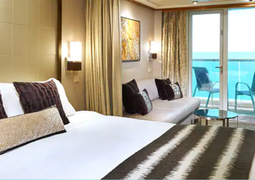 Cruise passengers are guaranteed the best of cabins and deluxe suites and staterooms. 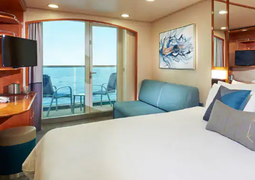 Indulge in luxury on board the Norwegian Sun with the ships spacious suites that are perfect for couples or the entire family! Some suites include balconies that come with wonderful ocean views. The accommodation of this ship was designed to create the perfect feel good atmosphere for all of its guests.